Are Microcurrent Facials Right for Me? Microcurrent facials use electrodes to pass a mild electric current through muscles in the face. Treatments help lift the muscles, resulting in more youthful-looking skin. At-home microcurrent machines are now available as an alternative to professional treatments. Consumer devices may take more time to produce effects, but they’re also less expensive. Microcurrent machines use electricity to give your face a lift – without surgery. Two electrodes pass a mild electrical current back and forth, stimulating the muscles beneath the skin and causing them to visibly perk up after just one treatment. A series of treatments can result in even more permanent improvements. Celebrities and medical estheticians alike swear by this trendy new treatment, but is it right for you? We investigated the history of microcurrent machines, how they’re used, and the best at-home microcurrent machines for your consideration. The central nervous system sends signals in the form of electrical currents to muscle tissues, causing them to contract. The charge from the electrodes in microcurrent machines stimulates targeted areas by mimicking these signals – even if the muscles are paralyzed or otherwise immobile. Microcurrent machines were originally used to treat patients suffering from Bell’s palsy, a facial paralysis that often affects only one half of the face. It soon became apparent to researchers that microcurrent machines could also be used to rejuvenate facial muscles in patients without paralysis. This marked the beginning of the use of microcurrent machines in aesthetics. As the name suggests, the current used in microcurrent machines is very small – far below the electrical threshold that could harm a human. A conductive gel is first spread over the skin, much like during an ultrasound, to keep the current from reacting with the skin and to ensure that it penetrates into the muscle instead. The gel also insulates you from experiencing any tiny shocks. In fact, some people find the process so relaxing that they actually fall asleep during their treatments. Microcurrent facials carry a much lower risk than surgery or injectables. However, it does take more treatments to achieve a cumulative effect, and these effects may not be as permanent as those of an actual facelift. Although microcurrent machines won’t completely erase deep lines and wrinkles, they do produce subtle changes over time. Some estheticians view microcurrent facials as a defense against aging, and recommend getting monthly maintenance treatments starting as early as in your 20s. Because of the number of appointments needed, this can end up costing thousands of dollars. Several at-home microcurrent machines have recently entered the market. As with most devices adapted for consumer use, they don’t offer as much power as the professional versions. Treatment may take longer and results may not be as substantial, but these machines only cost a fraction of the price of professional treatments. You’ll want to make sure that you’re purchasing a quality at-home microcurrent machine that will actually give you results. We’ve rounded up four of the most popular modules that will do just that. NuFACE is one of the most recognizable names when it comes to at-home microcurrent machines. About the size of your hand, this FDA-cleared device come in a kit with a base attachment to treat larger areas of the face, a charging cradle, a power adapter, gel primer, and a one-year warranty. If you’d like to more precisely target the areas around your lips or eyes, you can also get the optional Trinity ELE Attachment. 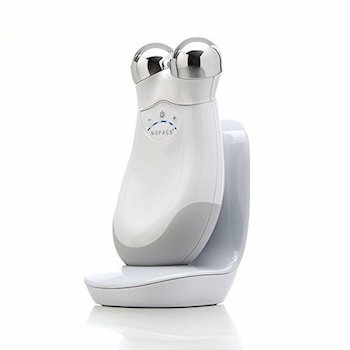 To target wrinkles while working out your facial muscles, NuFACE also offers an LED light Wrinkle Reducer Attachment. NuFACE recommends treating yourself five days a week for 5 to 20 minutes each time to begin, and then transitioning to maintenance treatments. As a fail-safe, the device automatically shuts off after 20 minutes of use. While it may look like a computer mouse, this device is actually a microcurrent machine in disguise. 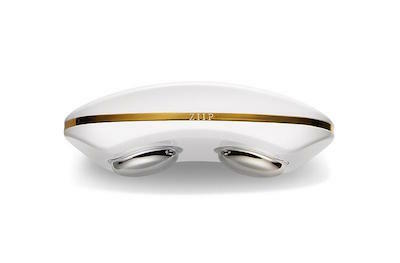 Instead of having electrodes that stick out prominently as in other designs, the ZIIP’s electrodes sit almost flush along the curved surface of the device, which nestles into the palm of your hand. If you’re looking for more precisely targeted treatments, note that there are no extra attachments available for this product due to its self-contained design. ZIIP offers six different programmed treatments or “electrical cocktails,” and you can select one using the accompanying ZIIP iPhone/iPad app. Cocktails include “Total Clearing” to target blemishes and “Pigment Treatment” to target dark spots. In addition to the ZIIP device itself, the kit comes with 80 ml of gel, a charger, a travel bag, a cleaning cloth and, of course, a user guide and instructions. This high frequency microcurrent device offers four different attachments, each designed to target something different – the comb targets the scalp and hairline; the mushroom is for larger facial areas, such as the cheeks and forehead; the bend is adapted for smaller facial areas, such as around the lips; and the tongue targets sensitive areas, such as under the eyes. This slender device is very portable and weighs just three quarters of a pound. Because of the relatively small surface area of the various attachments, it may take longer to treat larger areas like the cheeks. However, you won’t need to buy extra attachments as everything you need to target more precise areas is already provided. 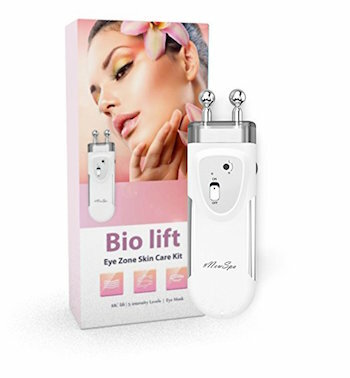 This microcurrent machine’s relatively small electrodes are designed to target those pesky lines and dark circles that plague your eyes. So, don’t expect to use the Bio Lift on large areas of your face unless you’re prepared to spending a long time doing so. The device is powered by AAA batteries (which are included), so you won’t have to contend with a pesky cord. It also weighs less than a pound, making it perfect for travel or for a small bathroom that doesn’t have a lot of storage space. Microcurrent machines are a noninvasive, low-risk way to fight aging and take preventative steps towards maintaining your youthful looks. Plus, the treatment itself is relaxing, unlike other cosmetic procedures – some people even liken it to getting a massage or going to a spa. However, you may not have the time or patience for consumer devices, or maybe you want more substantial results that can’t be achieved at home. If you’d like to consult a professional about microcurrent treatments or explore alternatives to facials, use Zwivel’s directory to find a qualified cosmetic doctor in your area.